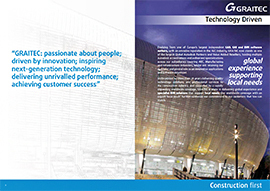 Canada – The GRAITEC Canada team is pleased to announce that they will be participating in the Construct Canada exhibition in Toronto, on 3-5 December 2014 in partnership with SolidCAD Solution, an Autodesk Platinum Partner. The 26th Annual Construct Canada will be held concurrently with PM Expo, HomeBuilder & Renovator Expo and Concrete Canada on December 3-5, 2014 at the Metro Toronto Convention Centre, South Building. Moreover, Graitec will be presenting its new solution; PowerPack for Advance Steel, a series of plug-ins, tools, new features for Advance Steel.